TULSA - A popular park will be missing one of its big attractions again this summer. 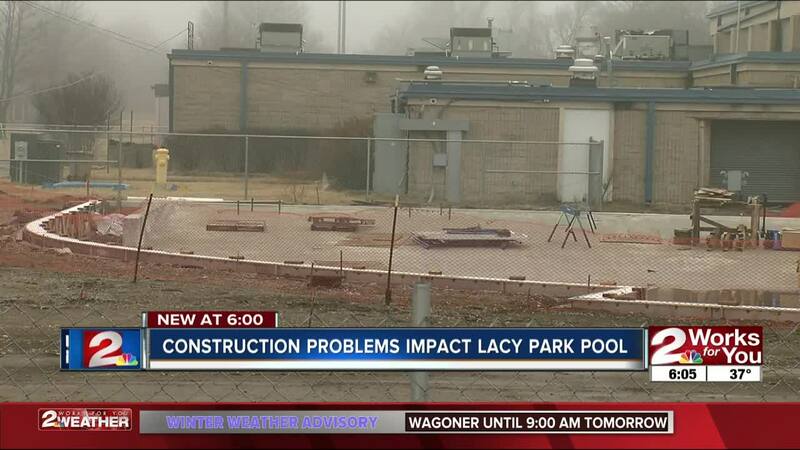 The opening of Lacy Park pool has now been delayed after crews found construction problems. Larry Fortenberry was upset after hearing news that the pool would be closed for another summer. "Well it's been almost two years since that pool has been open," Fortenberry said. "A lot of neighborhood kids aren't going to like that." Fortenberry grew up near the park and said the pool gives older kids an outlet and something to keep them from getting into trouble. "I noticed they did finish the little splash pad but that's for the younger kids. That's fine, but what about the older kids?" he said. Michael Reed is part of the Lacy Park Council. He said they were told a few weeks ago there was a 3.5-inch elevation problem with the pool that would have to be fixed for safety. "In correcting that problem, there was a lot of communications about how extensive that work was going to be on whether they were going to have to dig the pool up and start all over again," Reed said. Reed and others have hoped to bring more family events to the area when the pool finally opened. "Many of the parks had been closed and the pools filled and the City of Tulsa was going towards more of community centers. So we were trying to fill the void of the parks that were closed," Reed said. Now, those plans will have to wait. The city's parks department tells us they're working on the next steps to make sure the project gets completed as promised. Officials said they are currently waiting on results for the pool shell core. Once they have the results and receive proposed changes to fix the elevation issue, the city will meet again to determine the best course of action.